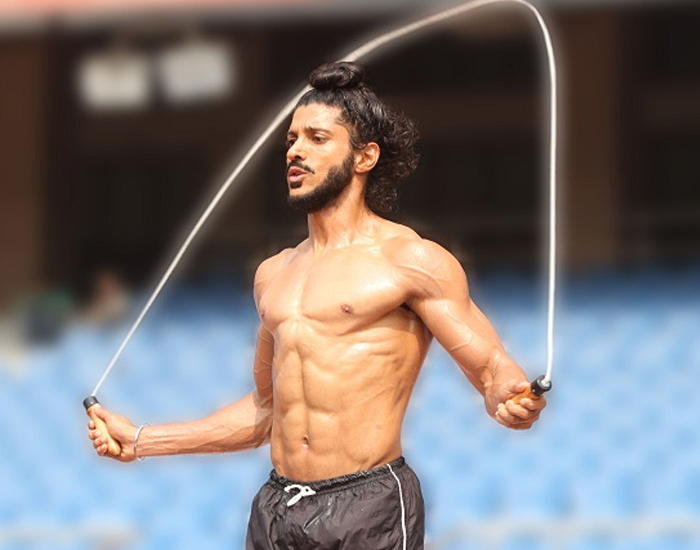 Farhan Akhtar starrer “Bhaag Milkha Bhaag” not only did incredibly well at the box office but also garnered him immense appreciation for his extremely fit and chiselled body. Farhan, who portrayed India’s iconic Olympian runner Milkha Singh in his biopic, earned appreciation for two things – his acting skills and his impeccable physique. He achieved a ripped body by following a strict diet plan and carefully curated workout sessions. His athletic body, crisp and toned abs swooned us over in 2013 and we can’t seem to get enough of him. As he turns 44 today, here’s looking back at his fitness journey and how he’s keeping it fit post the movie. Farhan eats a total of 6-7 small meals in a day. He makes sure to eat every 2 hours in small portions, instead of having big meals. This helps him boost his metabolism, thereby enabling him to burn more fat. He includes Chicken, Fish, and Green vegetables like Broccoli, Asparagus, and Mushrooms in his meals. He also makes sure to include Carbs and Proteins during his day. For small hunger pangs, Farhan munches on Almonds, Cashews, Pecans, Dried Apricots, and Cranberries. He likes to include antioxidant-rich food like Sweet Potatoes, Red Peppers, Tomatoes, Carrots, Kiwis, Grapes, Blueberries, and Mangoes during his day. Before hitting the gym, Farhan eats a fruit and a few grams of carbs to get ready for his extensive workout plan for the day. Post workout meals are extremely crucial for Farhan, as they help to optimise his recovery process and ensure that his body has all the supplies it needs to process, adapt, and reap benefits from his workout. He ends his workout session with a Protein Supplement to recover. Farhan starts his day with a healthy protein-rich breakfast consisting of a 6 Egg-white Omelette or Scrambled Eggs with Mushrooms and a glass of fresh fruit juice. 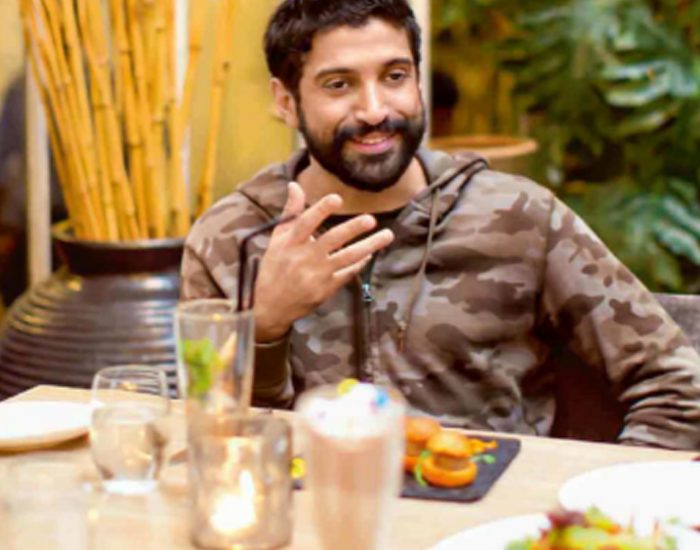 About 2 hours after his breakfast, Farhan eats Oatmeal with half a glass of skimmed Milk followed by Coconut Water after a gap of about 30-45 minutes. For Lunch, Farhan eats sautéed Vegetables like Cabbage, Beans, Pak Choy, Broccoli, Asparagus with Grilled Chicken (all cooked in Olive Oil). About 2 hours after lunch, Farhan has a Protein Shake since he undergoes a vigorous workout plan and needs protein for muscle development and recovery. For Farhan, an evening snack usually consists of Moong Dal or Boiled Chana salad with Cucumbers and Tomatoes. He enjoys munching fruits rich in antioxidants like Berries etc. Dinner usually remains the same as Lunch for Farhan. However, on some days he replaces Grilled Chicken with Salmon or Basa. He ends his day with a protein shake which he drinks before going to bed. Under strict training and guidance from Melwyn Castro and Samir Jaura, Farhan prepared himself to portray Milkha Singh on screen. He worked out for 6 hours in a day and his workout plan was carefully divided between his two trainers. His workouts are divided into Athletic, Functional and Weight Training – each having its own set of incredible transformation on him. Athletic Training – Consists of running and its 3 major components – upper leg motion, knee lift and push off. Functional Training – Focuses on strengthening the core as well as enhances flexibility. The routine involves climbing up the rope with weights tied on the legs and several abdominal exercises. Weight Training - Focuses on Hypertrophy Strength Training (HST) and Tabata. HST helps in gaining muscles. Farhan also regularly works on his Abs, Legs, and Biceps. His ab workout also consists of side benches and leg raises. While working on his legs, he also focusses on lunges, leg extensions, leg press, squats and jump squats. His bicep workout includes cable workouts, curls, concentration curls and preacher curls. From Bhaag Milkha Bhaag to now, Farhan Akhtar has impressed and inspired us with his physique and he is the perfect example of being and staying fit. As one of the most versatile members in Bollywood, Farhan has set the bar high and it was only possible with his sheer dedication and determination. Here’s wishing our on-screen Milkha Singh a Happy and Healthy Birthday!